Welcome to Reef 2 Rainforest. We are leading specialist Aquatic and Reptile shop based in Clacton-on-Sea, Essex. Fronted by a small team of experts, we focus on providing Marine & Tropical Fish, Reptiles, Corals, Plants and professional tank and pond maintenance service. R2R stock only the highest grade of livestock, in the finest display equipment hourly maintained by our dedicated staff. You can guarantee that all our creatures are sold in the peak of health ready for their long term well being in their new home. We also stock a large selection of products, foods, chemicals, testing kits and accessories from the world’s leading aquatic and reptile brands. We have a stock a wide range of enclosures, and we can have any size made to order, so you will be able to find your perfect new Aquarium or Vivarium. Currently we offer free delivery and installation on all new tank purchases, if required. We also offer a full professional home visit pond and tank installation and maintenance service. If you do not have the time or experience, or simply looking for that professional touch to take your install to the next level, contact or enquire in store for a free quotation. We pride ourselves of creating a friendly and welcoming atmosphere within the shop, so whether you are just starting out or you a more experienced owner, we will always be happy to point you in the right direction whenever you pop into the store. We have a wide range of stunning tropical fish in stock. Stock includes Angel Fish, African Cichlids and Disus. Pop in store to see our colourful stock. All our fish are in quarantine for 6 weeks before coming into the store and are fed a very good diet. This means your fish are healthy as they leave with you. We are also able to order in other stock if we dont have in store what you was looking for. We will order the stock in and then give you a call when your fish has arrived and is healthy. We have a wide range of cold water fish in stock starting from £2.99. Lots of colours and sizes in store. We have many great starter tanks in stock that you can keep cold water in like this AquaEl Classic 40 here for just £59.99. This tank also includes a heater so you can upgrade this tank to a tropical set up when ever suits you. We stock many great Koi Carp for all the pond lovers out there too. We stock some amazing marine fish. If we do not have the marine fish you was looking for, talk to one of our friendly staff and we can order it in, any size and colour, ready for you to collect once it has arrived. All marine fish are from TMC (Tropical Marine Centre). All our fish are kept in quarantine for 6 weeks before entering the store. Once in store all fish are fed a good diet and are healthy. Also in store we stock amazing 'Reef Dipped' hard and soft coals which will take the look of your marine tank to another level. Pop in store and check them out. Feeling Brave? We stock some amazing reptiles in store. From chameleons all the way to corn snakes we offer a great range. In store is all the reptile accessories and equipment you will need to make sure your reptile is kept healthy and the area they live is clean and well looked after. Need Help? Ask one of our friendly staff members for some advice on how to keep your reptile and what is best for it. Rio Line LED - Timeless design, perfected technology and meticulous workmanship. A Rio aquarium from JUWEL discreetly accentuates the underwater world that you have arranged. Lido Line LED - Our Lidos elegantly fits into any surrounding due to its discreet design. You will be surprised by its elegance and compatibility. Vision Line LED - Experience the aquarium fascination from a new perspective. A Vision accentuates the optical depth through its curved front panel and offers surprising views of your underwater world. Trigon Line LED - Trigon aquariums turn every corner of the room into a decorative eye-catcher. Primo Line - The perfect start with a system. Experience the easiest entry into the world of aquariums with state-of-the-art components. Reef Cicrulator 2500 - REEF CIRCULATOR are high-performance circulating pumps for saltwater aquariums. Thanks to the maglev suspension system employed in the rotor chamber, the pump is virtually noiseless and extremely energy-efficient. Low energy consumption also means that its operation does not result in an undesirable increase in the water temperature. The exceptionally reliable magnetic hanger makes the pump easy to install right on a tank wall. Thanks to the swivel connection, the direction of outflow can be freely adjusted with high precision. The pumps are available in a wide range of sizes, suitable for small, mediumsized, and large saltwater aquariums. AquaEL Classic 40 - The AquaEl Classic 40 Rectangular Aquarium Kit is a modern aquarium set measuring just 41cm in length and includes lighting, heater and filter that is suitable for both tropical or coldwater fish. The tank itself is a modern, stylish design with a 25 litre capacity. The use of electronic lighting components eliminates the effect of heating the water and eliminates the flickering commonly associated with fluorescent lamps. The lights are long lasting and energy efficient. AquaEL Classic 50 - Like all of the Aqua El range the Classic 50 Rectangular Aquarium Kit is a contemporary design that has all the necessary accessories to make sure your tank runs smoothly. The tank has a hinged feeding hatch built into the lid which means the sleek uniform design is not disrupted. A common problem with fluorescent lighting is flickering or shaking. The ballast built into the sturdy hood secures the T8 tubes which helps to stop this. This method also stops the water overheating and affecting the temperature. As standard, each of the Classic tanks include a FAN filter and automatic heater. Saving money and time, you get everything you need at a great price and you're ready to go as soon as your aquarium arrives. The filter provides effective filtration to keep the water clean and healthy, and should you have a tropical tank the heater makes sure your fish are kept at the right climate. Air Pump 100 - There are three models with a pump outlet from 100, 200 (2 x 100) and 400 (2 x 200) l/h, on which the smallest model has one and the two larger ones both have two individually adjustable air outlets. And they come equipped with one or two EHEIM diffusors. The air flow can be regulated at each outlet on the pump and also on each diffusor. This allows you to set your own individual bubble effect. By the way: Vibration dampening rubber edgings contribute to the pump’s quiet operation. The air pump stays still and doesn’t “wander about”. Or you can hang it vertically on the aquarium glass. Specially for this there is a hook. EHEIM thermocontrol 25W - With the EHEIM precision heater your fish receive exactly the right temperature – in any aquarium. Obvious ideas often are the best ones. For example, the aquarium heater as a rod. The heating rod is simply hung in the water and heats it. It is true that the principle is still the same as decades ago. But a lot has changed in the meantime. And today the EHEIM adjustable heater is an ultra-modern electronic thermal device with the best available technology. A jacket made from special laboratory glass increases the heating surface, serves as a heat shield and ensures optimum even heat emission. Eheim Classic 250 - With EHEIM classic you have everything that makes up a good external filter. By choosing a classic you won’t go wrong. Because you have chosen a reliable, millionfold tried and tested piece of equipment. All models perform to the highest quality standards. First class components and carefully matched features ensure perfect pump and filter performance. Additionally, you have the proverbial EHEIM quiet running, robust durability and low energy consumption. You will be very satisfied. PowerSun® H.I.D. Metal Halide UVB Lamp - The PowerSun® High Intensity Discharge (H.I.D.) is a Metal Halide lamp which emits UVA, UVB, and heat all in one lamp! This High Output UVB lamp is perfect for large habitats. The proprietary Zoo Med lamp construction creates a true flood-lamp effect, eliminating dangerous UV “hot-spots” common to other metal halide reptile lamps. ReptiCare® Terrarium Controller - Provide a natural day/night cycle for your reptiles with this 24-hour Programmable Timer & Power Strip in One! -24 hour programmable lighting timer. -Provides a natural day/night cycle for your reptile. -Grounded 3 prong receptacle for safety. Turtle Clean™ 30 Coarse Pre-Filter Sponge - Zoo Med’s Coarse Pre-Filter Sponge is the first line of defense in removing dirt and floating debris from your terrarium or aquarium. Although filters are used to keep your water clean and safe, Zoo Med also recommends weekly water changes of at least 20%. When adding tap water (during a water change) make sure you add Zoo Med’s ReptiSafe® to remove chlorine and chloramines. FROZEN BRINE SHRIMP PLUS™ - Frozen Brine Shrimp Plus™ is a gourmet frozen food for all carnivorous and omnivorous tropical fishes and invertebrates. It is a special blend of brine shrimp supplemented with a nutritious blend of seafood, plankton, algae and vitamins that mimic the nutritional value of a natural diet with an appealing flavor to entice finicky eaters. This formulation can be fed to a multitude of fish and invertebrates that enjoy the familiar flavor of brine shrimp and require a balanced diet. Brine Shrimp Plus does not contain a gel binder and is an excellent product to simultaneously feed the fish corals and invertebrates in reef aquariums. The bite-sized pieces feed the fish; the juices and fine particles feed the reef. This blend of premium ingredients is easy for fish and invertebrates to digest so they produce less waste and aquariums stay cleaner. INSTANT BABY BRINE SHRIMP - Identical in use and appearance to freshly hatched Baby Brine Shrimp, but the hatching and separation has already been done. -Ideal food for delicate fish, fish fry and as food for invertebrates. Can be used both in freshwater and marine tanks. -Excellent buoyancy, so the food remains in the water column to facilitate feeding. -The product can be kept and stored at normal room temperature as long as the bottle has not been opened. To make sure, check for the noise at the moment of opening. -Developed in collaboration with the Artemia Reference Center. Does not cloud the water. -Does not cloud the water. PRIME REEF™ FLAKES - Prime Reef™ Flakes are a gourmet food, rich in seafood and zooplankton, for all reef aquariums. They contain a high inclusion of fresh seafood ingredients that mimic the nutritional value of a natural diet with an exciting flavor that fish cannot resist. This formulation can be fed to a multitude of fish and invertebrates that require pure marine proteins and a balanced diet. This blend of premium ingredients is easy for fish and invertebrates to digest so they produce less waste and your aquarium stays cleaner. GC Gravel Cleaner - Convenient, easy-to-use gravel cleaner available in three different sizes. GS 45 Aquarium Glass Scraper - For the simple and effective cleaning of interior aquarium glass panes. New Life Spectrum Betta Formula - A balanced daily diet in a small semi-floating pellet ideally suited to Bettas. New Life Spectrum AlgaeMAX - A complete diet, rich in a variety of natural algae and seaweeds to suit herbivores. In our popular 1mm slow sinking pellet. New Life Spectrum Thera A - Jumbo Fish With Extra Garlic - ‘Thera A’ is a balanced diet packed with garlic (containing allicin compounds) and especially suited to feeding during periods of stress such as: quarantine of new fish; during disease recovery; and for fry before and after netting and movement. Garlic helps to optimise the immune system and protect against parasites. ‘Thera A’ is not a medication, and disease treatments should continue to be used as appropriate. AquaHabitats H2Air 60 Pump - High performance air pump. -Extremely efficient with silent operation. -High quality components for long lasting, continuous operation. -Compact design - simple to install and maintain. 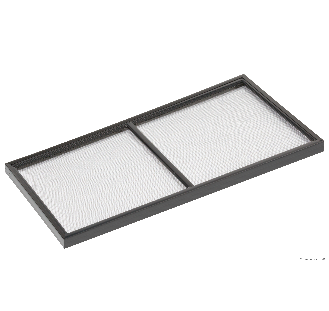 Air filter and diaphragms are easily replaced. Seachem Ammonia Alert - Reliable. -Continuously monitors and detects toxic free ammonia. -Sensor changes colour according to ammonia concentration in the water. -Sensitive to less than 0.02mg/l of free ammonia. -Suitable for marine or freshwater use. SCREEN TERRARIUM ALUMINUM SCREEN HABITAT - The Exo Terra Screen Terrarium is a perfect habitat for arboreal reptiles and amphibians that are sensitive to stagnant air. The non-restricted air-flow provides optimal ventilation while minimizing odors and fungus growth in your reptile’s habitat. The screen design provides a broader temperature gradient, which helps your reptiles to regulate their body temperature more effectively and prevents overheating. The aluminum screen mesh allows ultraviolet rays from UVB lights or the sun to penetrate deep inside the enclosure. The substrate tray allows you to place a small layer of substrate to absorb spray water and increase humidity levels. The substrate tray can easily be removed from the enclosure through the swiveling bottom door. SCREEN COVER / FOR GLASS TANKS - The Exo Terra Screen Cover is an easy-to-install cover for aquariums and glass tanks. The lockable sliding door allows partial opening of the enclosure, thereby reducing stress to the inhabitants and the risk of escape. The strong metal screen provides ventilation and allows necessary UV penetration while ensuring reptiles and even feeding insects are safely secured. HEAT MAT TERRARIUM SUBSTRATE HEATER - Reptiles and amphibians are cold-blooded and in their natural habitat they often use surfaces heated by the sun to warm up. The Exo Terra Heat Mat is a terrarium substrate heater that simulates these surfaces heated by the sun. Exo Terra’s Heat Mats are an ideal 24-hour primary or secondary heat source for tropical or temperate reptile and amphibian species and essential as a nighttime heat source for many desert species. The Exo Terra Heat Mat permanently adheres to the terrarium, forming a solid bond for optimal heat transfer. Can be used with an Exo Terra Thermostat and/or in conjunction with additional heat sources for higher temperature species. Goldfish Flakes - Our principal cold water flake diet delivers a palatable and highly digestible balanced feed. Incorporating our key nutritional ingredients, natural pigments and minerals, it allows your fish to maintain good health and colouration. Marine Flakes - Our principal Marine Flake diet delivers a palatable and highly digestible balanced feed. They may be used in conjunction with Vitalis Algae Flakes and also in rotation with the Vitalis Platinum Marine Range to maintain peak health and condition in your fish. Tropical Flakes - Our principal Tropical Flake diet delivers a palatable and highly digestible balanced feed. Incorporating our key nutritional ingredients, a blend of algae, natural pigments and minerals it allows your fish to maintain good health and colouration. We can order in any product from these suppleirs. Pop in store or give us a call to get yours. Cichlids are fish from the family Cichlidae in the order Perciformes. Cichlids are members of a suborder known as Labroidei, along with the wrasses, damselfishes, and surfperches. This family is both large and diverse. The bearded dragon's scientific name is Pogona Vitticeps and they are medium sized lizards which are generally 12-24 inches in length from their head to the tip of their tail. There are many different bearded dragon colors. "Great friendly service from the staff, help and advice has been good, now had fish for 2 years currently and still going." "Don't bother using any other shop in clacton, or even Essex for that matter. I've visited most of then and none come any where near this place Darryl and his Son are extremely knowledgable and always happy to help. ."
"Very helpful staff all the fish look very healthy nice selection of stock don't no what Michiel van Bokhorst is on about but I am yet to see any bad stock in this shop he must be on about another shop iv bin going there for the last 6 years and all ways bin happy with there shop well worth a pop in there. ;-)"
"Excellent staff, great knowledge of products and reptiles, affordable prices, clean and tidy"